Images of Dr. Macchiarola from his family archives and from the collection at St. Francis College. 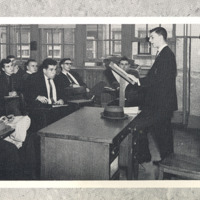 Dr. Macchiarola as a member of the Freshman Class appears in the front row surrounded by his classmates. Dr. Macchiarola taking notes in a meeting of the I.R.C. 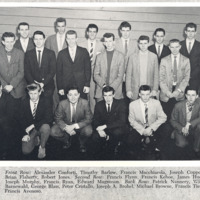 (International Relations Club) a student club at St. Francis College. Dr. Macchiarola at International Relations Club meeting. 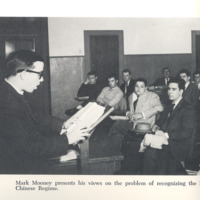 Yearbook caption: "Mark Mooney presents his views on the problem of recognizing the Red Chinese Regime."